"Ninja Gaiden Dragon Sword is a video game released for the Nintendo DS featuring the Dragon Ninja, Ryu Hayabusa as the main protagonist. 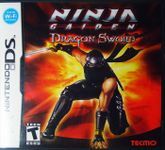 The game is the first portable video game title in the series to be developed by Team Ninja. This action-adventure title is presented in a 3rd person, pseudo-3D manner, meaning all the game-models are rendered in full 3D, but the world the player travels around in is pre-rendered. When played, the Nintendo DS is held sideways, as in Hotel Dusk: Room 215. The left screen shows the area map, while the right displays the main gameplay, when set for right-handed play, and reverse when set for left-handed play. Set six months after Ninja Gaiden on the Xbox and PlayStation 3, Ryu Hayabusa has rebuilt the Hayabusa Village. When fellow villager and kunoichi, Momiji, is kidnapped by the Black Spider Ninja Clan, he is forced to find her, while uncovering the secrets behind the mysterious Dark Dragonstones and their relation to the Dragon Lineage." Source: Wikipedia, "Ninja_Gaiden_Dragon_Sword," available under the CC-BY-SA License.